Today, we welcome Managing Director Dr. Alfred J. Svobodnik of Konzept-X GmbH, a COMSOL Certified Consultant and developer of multidisciplinary virtually optimized industrial design technology (M-voiD® technology). MP3 players, smartphones, and tablets allow us to listen to our favorite music almost everywhere. While driving in a car, we should also enjoy the highest sound quality. Learn how to use simulation to reproduce sound in one of the most difficult environments — a vehicle — to design better automotive sound systems. Automotive acoustics experts are confronted with the complex problem of finding the optimal position for speakers in vehicles because of their extremely complex architecture and confined space. A mix of different materials in a vehicle cabin, such as textiles, plastics, metals, glass, etc. ; acoustic influences; and disturbing engine or road noise must be analyzed until any noise concerns are rectified and eliminated. A CAD model of a vehicle door with speaker. Image by Konzept-X GmbH. 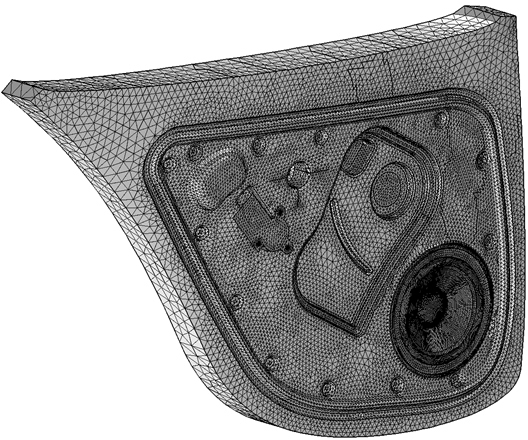 The use of modern simulation methods in the concept and design of a vehicle’s acoustic components and the evaluation of the systems in the early phase of product development are becoming increasingly important. This is partly thanks to the demand for shorter development cycles and the increasing expansion of vehicle model ranges. Using the COMSOL Multiphysics® simulation software, experts are able to simulate complete acoustics on the basis of a vehicle’s CAD model. As we’ll discuss, a proper modeling strategy is important to bring automotive interior acoustics to a new level of performance. To begin, we create a multiphysics model of a vehicle’s loudspeakers, of which electromagnetism, mechanics, acoustics, and sometimes even thermal transfer and fluid dynamics are taken into account. It is most important to analyze the different physical domains, as each domain interacts bidirectionally with each other. To enable a realistic simulation, we also have to deal with the path-dependent dynamic effects and nonlinearities (including instabilities) in each domain. We use a unique mixture of 1D (lumped parameter), 2D, and 3D (finite element) models for this multiphysics simulation. Lumped parameter models are based on 1D scalar equations to describe a physical variable. Fortunately, they can describe the system behavior of a speaker that interacts with an enclosure and the resulting sound radiation by including several physical scalar variables. For the mechanical and acoustic (airborne sound) area, however, there are substantial limitations when using only scalar values. For example, in the mechanical system, only piston-like movements can be described. Thus, the applicable frequency range is limited. At higher frequencies, the vibration behavior is no longer piston-shaped and we have to use a multidimensional modeling approach. In that case, the finite element method is recommended. This fact has led to the development of models based on matrix methods. 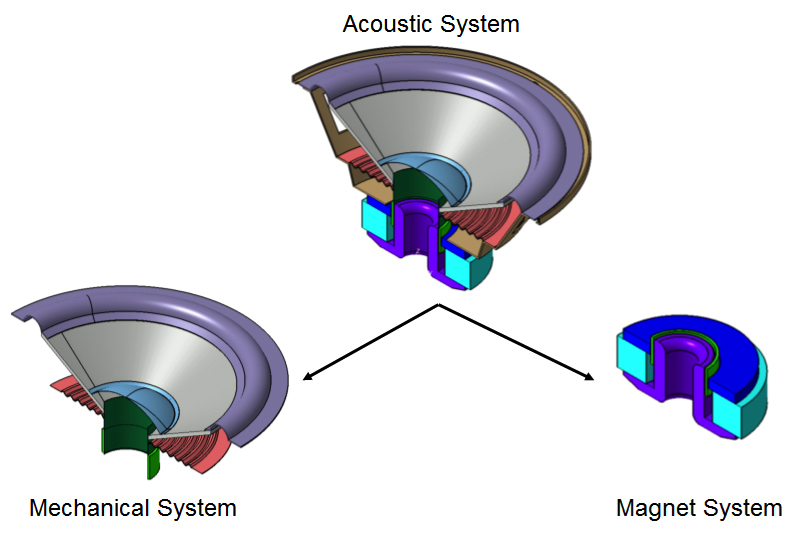 For this demonstration, it is necessary to use a lumped parameter model for voice coil electromagnetics, a finite element model for the mechanical domain, and a finite element model for the acoustic domain in order to develop a fully coupled electrical-mechanical-acoustic simulation model for loudspeakers. If we tie together all of the governing equations of the different physical domains — electrical, mechanical, and acoustic — we get a coupled system of equations describing the multiphysics of an electroacoustic transducer in the frequency domain, as shown below. The coupled multiphysics system for a loudspeaker. Image by Konzept-X GmbH. Cma and Cam are coupling matrices connecting the mechanical and acoustic domains. These coupling matrices arise from the assumption of continuity of the velocity and pressure in the mechanical and acoustic domains in the direction normal to the coupling surface. De is an electromagnetic damping, which is derived from the back electromagnetic force. Consider that the coupled model alone will not automatically lead to realistic simulations. We also need to accurately describe the material properties in the electrical and structural domain. Thus, a key aspect of the simulation is the material measurement procedures specifically designed to measure electrical and mechanical parameters and their frequency dependence. 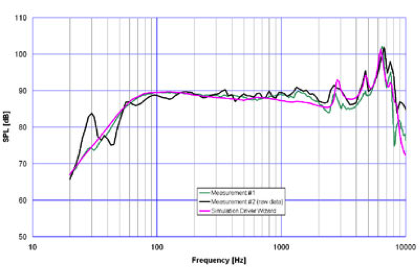 In the following figure, we compare the measured and simulated frequency responses of the radiated sound pressure. The accuracy of the simulation, based on the previously presented theory, is within the manufacturing tolerances of the loudspeaker, and thus can be deemed a realistic simulation. Comparing measurements (represented by green and black) and simulation results (shown in pink). Image by Konzept-X GmbH. The most important challenge for a successful automotive acoustic simulation is the strong coupling of all physical domains involved. Strong coupling within that context means that each physical domain interacts bidirectionally with other domains. 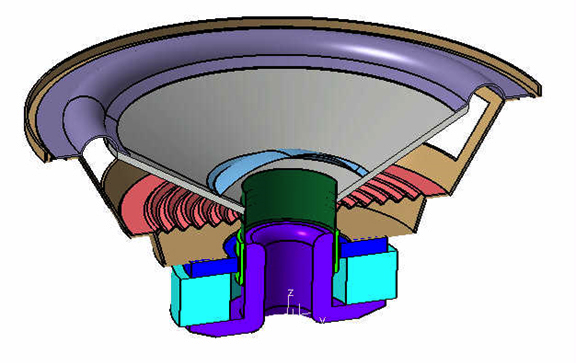 A CAD model of a loudspeaker (cut). Image by Konzept-X GmbH. While the motor system is typically treated as an axisymmetric device, and thus simplified 2D models can be applied for a majority of applications, we must account for the strong coupling to the structural domain (the loudspeaker’s vibration system) via the voice coil acting in the magnet’s air gap. For some motor structures, the variation of the flux field in the axial direction is also of crucial importance. Thus, finite element models for detailed motor design and optimization are commonly used. At large excursions of the voice coil (when the loudspeaker is driven in the region of nominal power), a significant portion of the voice coil moves out of the main flux field, and thus less mechanical force is being induced. This nonlinear effect is essential and causes unwanted distortion in the radiated sound. Additionally, voice coil inductance is also dependent on voice coil excursion and current. This leads to the need for nonlinear models to predict the loudspeaker behavior at large signals. For system- or subsystem-level simulations (without the goal of designing a motor), 1D lumped models (that include additional nonlinearities to predict large signal behavior) are efficient. As mentioned before, the structural domain has to be modeled via finite elements to account for nonpistonic effects. The existence of circumferential bending waves can only be accounted for by 3D models, thus 2D models have to be used with care. An additional challenge is the thin-walled structures of cone and dust caps, as well as surround and spider caps. By simply using 3D solid elements, we could end up with a very large and unhandy model, thus we should use shell finite elements to model the vibration system. At large signals (and thus large excursions), major nonlinear effects arise from the material behavior and change in geometry, leading to a change in the stiffness of the vibration system, thus generating distortion in sound radiation. Even if we had a superlinear material, its change in geometric stiffness would lead to distortion. On top of this, due to the change in geometric stiffness, instabilities may occur (snap-through and bifurcation), defining an additional source of heavy distortion. The major challenge here is the strong coupling to the structural domain. In other words, the movement of the loudspeaker’s vibration system has an effect on the surrounding acoustic medium (air and sound waves are generated) and the surrounding air has vice versa an effect on the movement of the structural domain (typically called an added mass and stiffness effect). 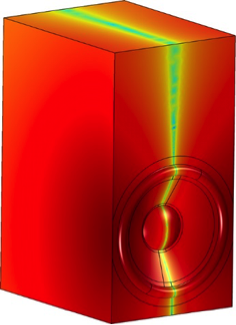 The multiphysics of a loudspeaker (CAD model). Image by Konzept-X GmbH. The multiphysics simulation of a loudspeaker is the very first step to achieving an outstanding sound performance. Also of particular importance is the mechanical and acoustic integration of the loudspeakers in the vehicle. For developers, the space requirements of speakers can be particularly challenging. 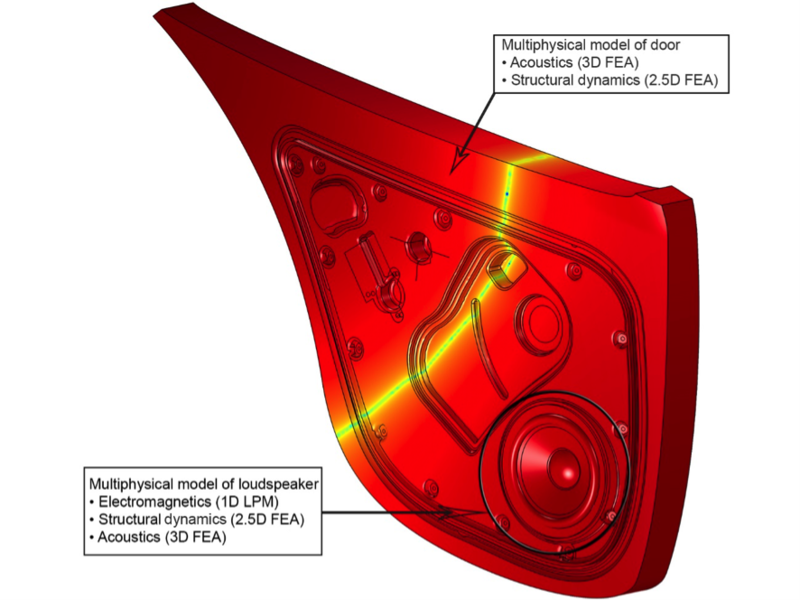 By using CAE-based simulation tools, like COMSOL Multiphysics, we can optimize the speaker integration in the early design phase. As a result, we can avoid errors such as spurious oscillations of enclosures and structural parts. We can instead take completely new ways of integration into account. One example is the use of the cavities of the vehicle structure as resonance volume for the speakers, because loudspeakers require an enclosure as resonance volume in order to reproduce low frequencies. By limiting available space, these enclosures often have a complex geometry and an important influence on the sound. Consequently, in the next step, the previously designed multiphysics model of the speakers has to be extended and the enclosures have to be integrated and provided with mechanical and acoustic characters. An example multiphysics model of a loudspeaker and enclosure (vehicle door). Image by Konzept-X GmbH. Sound pressure level inside the door cavity. Image by Konzept-X GmbH. Sound pressure level inside the woofer enclosure. Image by Konzept-X GmbH. Then we integrate the car cabin, with its mechanical and acoustic characters, into the simulation model. The car cabin has an important impact on the perception of sound too. Due to the mix of different materials, such as leather, plastic, and textiles, a hybrid approach is used, as the coupled multiphysics model alone will not automatically lead to realistic simulations. The various materials with totally different behaviors and joining techniques require detailed descriptions of the material properties in the electrical and structural domain. Thus a key aspect here is material measurement procedures specifically designed to measure electrical and mechanical parameters. In order to create an outstanding sound performance of the complete sound system in the vehicle, psychoacoustic characteristics and properties are of importance as well (psychoacoustics deals with the human perception of sound). Through careful virtual tuning, irregularities and resonances in frequency response are compensated. Extensive tests and measurements are carried out in further steps. Finally, the virtual audio system must undergo an analysis by human ear. These listening tests are necessary for a final evaluation of the audio performance, especially in terms of spatial reproduction. Within the multiphysics simulation model of our vehicle audio system, the distribution of the sound can be determined, even in the furthest corner of the car. All factors that affect the sound in the interior, however minimal, are taken into account. By means of a special reproduction technique, it is also possible to make the virtual sound system audible on a computer (also known as auralization). In the past, the integration of loudspeaker systems was evaluated mainly with real prototypes at a late stage of development. This process took a lot of time and money and also bore a risk in the progress of the project. 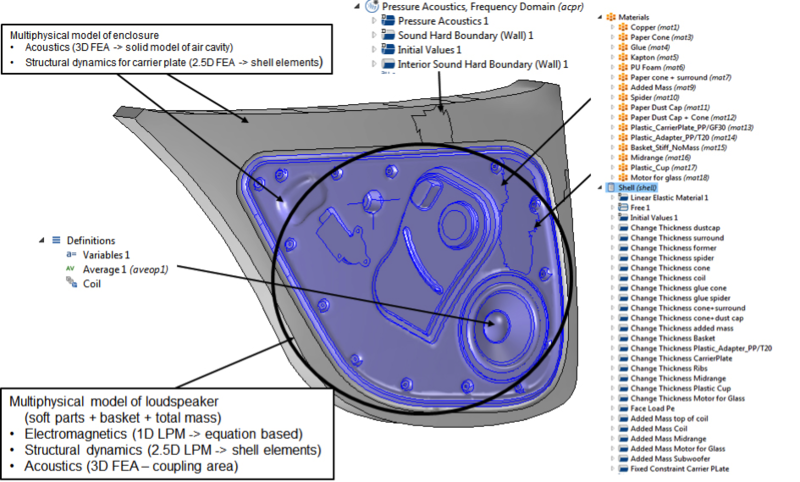 Thanks to modern simulation technology, we can virtually analyze the optimal positions of loudspeakers and select adequate components in the early stage of development. COMSOL Multiphysics interface couplings are able to bring automotive audio acoustic simulations to a new level of predictive power. 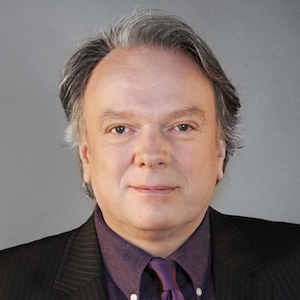 Dr. A. J. Svobodnik is a thought leader, entrepreneur, engineer, and technical scientist. He has worked in audio and acoustic applications for over 25 years. Svobodnik is managing director and cofounder of Konzept-X GmbH, a COMSOL Certified Consultant specializing in providing consulting services and innovative technologies for automotive audio and technical acoustics, as well as the developer of multidisciplinary virtually optimized industrial design M-voiD® technology. Konzept-X was founded in 2011. M-voiD is a registered trademark of Alfred J. Svobodnik in the U.S. and other countries.